It was December 2006 when I decided to walk every day. Now I do not walk all that fast but with the little pedometer it keeps track of the aerobic steps and calculates the distance and the calories burned. My old meter keeps only 7 days records (better ones keep over a month and will upload to computer) . I no longer suffer from any back or hip pain. I have WAY more stamina for all activities. My last RV trip to visit my parents I had no 'road' pains (two days on the road) (totaled 2300 miles) . I walked for 10 minutes at every rest stop and actually did more steps while on the trip. Alex (yard full of stone and cactus), his mom was a docent in a cactus place in New Mexico when he was a kid. Sue, with a vegetable garden in the front yard. Once upon at time, pet parents living in California didn't have to worry too much about nasty things like parasites and zoonotic diseases (diseases transmitted from pets to people). However, new data from the Centers for Disease Control & Prevention (CDC) shows increasing parasite populations in the West. Mike Paul, DVM, executive director of the Companion Animal Parasite Council. "When I was studying veterinarian medicine back in the early 1970s, heartworm and other common parasitic diseases were virtually non-existent in the West," says Mike Paul, DVM, executive director of the Companion Animal Parasite Council (CAPC) who worked as a veterinarian in San Francisco for many years. He says this is no longer the case as a result of a complex combination of factors. Temperate climates and changing landscapes (more irrigation and more moisture means more parasites), outdoorsy lifestyles, and the increasing number of people who travel with or who have relocated with pets (that are infected) to the West Coast from other regions are all contributing to the local rise in parasites and related diseases. The CDC reports that about 14 percent of the total U.S. population is currently infected with Toxocara, or internal roundworms, contracted from dogs and cats. (Yikes!) A 2007 CAPC survey showed that less than one-third of pet owners treat their dogs and cats year-round for flea and tick control, even though these parasites can thrive all year long — indoors and out. "Once a parasite gets established in a particular area it never goes away," says Dr. Paul, adding that nearly 40 percent of coyotes in our state are infected with heartworm. Raccoons are also disease carriers. And as these animals' natural habitats continue to merge with our own it makes sense that our pets (and us by extension) would be at greater risk for possible infection. These statistics inspired Dr. Paul to "take the show on the road" to help increase awareness among pet parents about parasite-related diseases and how to prevent them. 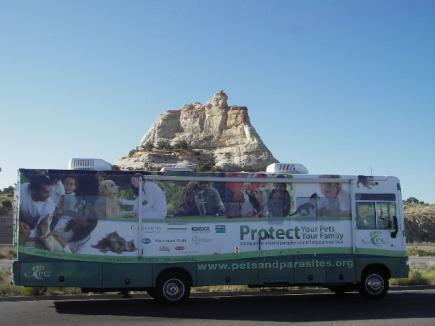 He and his "Parasite Education Road Show" of veterinarians and parasitologists (complete with its 33-foot-long RV emblazoned with images of dogs, cats and children) is traveling to seven cities in four states between now and July 11 to help educate pet parents and veterinarians about the prevention of parasites and related diseases in pets and people. Taking the (parasite prevention) show on the road. "My goal when I started this project wasn't to panic people," says Dr. Paul. "All of the recommendations we make are about common sense: 'Don't stick that in your mouth; Wash your hands.' The usual stuff. Most people already know these things, they just don't practice them because they think 'It won't happen to me.'" Zoonotic diseases, although rare, can have devastating outcomes especially for young children (who are also the most likely to become infected because of their propensity to put everything in their mouths). The good news is that they can be prevented with good hygiene and year-round deworming and parasite control (no matter where you live) for our furry friends. As part of the Parasite Education Road Show, the CAPC is hosting two FREE educational events in San Francisco this Sunday, July 5, at the SPCA Maddie Center, and on Monday, July 6, at Justin Herman Plaza. WHERE/WHEN: SF/SPCA Maddie Center (Sunday, July 5, 11 a.m. to 5 p.m.), 250 Florida Street in San Francisco; Justin Herman Plaza (Monday, July 6 11 a.m. to 4 p.m.), 1 Market Street in San Francisco. Find more helpful health tips about parasite prevention here. When I met Dale in March 1989 he had a motor home and loved to go to Disneyland. He also had a nine year old daughter, Rhiannon, and a four year old son, Donovan, and they both lived near us in Walnut Creek. I had three (another one was born in 1993) grandsons but only one, Benjamin, who was eight years old, lived near us. We loved to take the children to Disneyland in the motor home and one of the highlights of the trip for me was watching Captain EO starring Michael. Between 1989 (Captain EO played in Disneyland between 1986 and 1997) and 1996 we took two or three of the children to Disneyland every summer (the year Ben was 16 was the last year he wanted to go to Disneyland with his grandmother). This is what Tony Hicks had to say about Captain EO in his column in the Times Newspaper this morning: "'Captain EO' (1986): Jackson's 3D collaboration with George Lucas and Francis Ford Coppola about a hero and his crew fighting aliens and changing them into well-groomed dancers with puffy hair spent a dozen years thrilling guests at Disneyland. It's a bit silly, but shows off Jackson's best traits: his love of all things magic, his dancing, and his then-unstoppable personality. It's difficult to pin down whether it ever went to DVD, but you can find good versions to watch on YouTube." A few minutes ago my wonderful, loveable Dale ran the YouTube version for me and I got to watch Captain EO on the computer. It was wonderful and I didn't even have to stand in line! In a recent interview with Hal McDonald, Probiotic Formulator, Hal mentioned that one of the many functions of good bacteria is to lubricate the colon. This helps to avoid constipation problems. Of course, a diet high in plant fiber is also needed. Any time you consume any pharmaceutical, especially antibiotics, one of the big side effects is constipation, due to the mass killing of bacteria, including the friendly bacteria, that resides in your gut. Yogurt and such is not enough to offset the carnage. You can, and should, consume Flora-G Plus before, during, and after any pharmaceuticals you take. It can take you several months of supplementation to fully recover your full complement of friendly bacteria. How to research your health question online. Post a comment, let us know if you would like to attend a free webinar on the subject. Denmark banned hydrogenated oil and heart-related disease in Denmark was cut in half. So, now, in the U.S., you can claim your product is "Trans-fat Free" if there is .5 of a gram or less in each serving (for instance, a serving of tiny packaged cookies can be two and a serving of potato chips can be nine or less). So how can you tell tell if the manufacturer is trying to pull the wool over your eyes? You can read the ingredient list. If hydrogenated oil is listed you know they are trying to trick you. The only way for Americans to protect their hearts (The American Heart Association recommends consuming no more than 2 grams of trans fats per day, and people often eat more than a few servings of packaged treats per day) is to read the label and refuse to eat anything that contains any amount of hydrogenated oil (trans fats). The Labels are pretty confusing... would you like us to create a list of "Bad Snacks" so you can just check the list? Problem with missing heart beats. Cardiologist and stay at hospital found nothing wrong with heart and follow up stress test showed good heart, heart rate and blood pressure. I have tried many vitamins,minerals,herbs such as Dan Shen and Terminalia Arjuna and Natto. Mediation, acupuncture, acupressure, qui gong. Nothing helps so far. Magnesium/potassium/sea salt combo don't help either. What next can I do? For sure I am NOT going to a regular doctor as they just want to cut and drug with all kinds of bad side affects. * Germanium – 1-2 tsp. * Selenium – 1 tsp. * Vitamin E - 800 I. U.